Ham bone + rice + water = Ham Congee, aka Chinese Ham Bone Rice Soup. 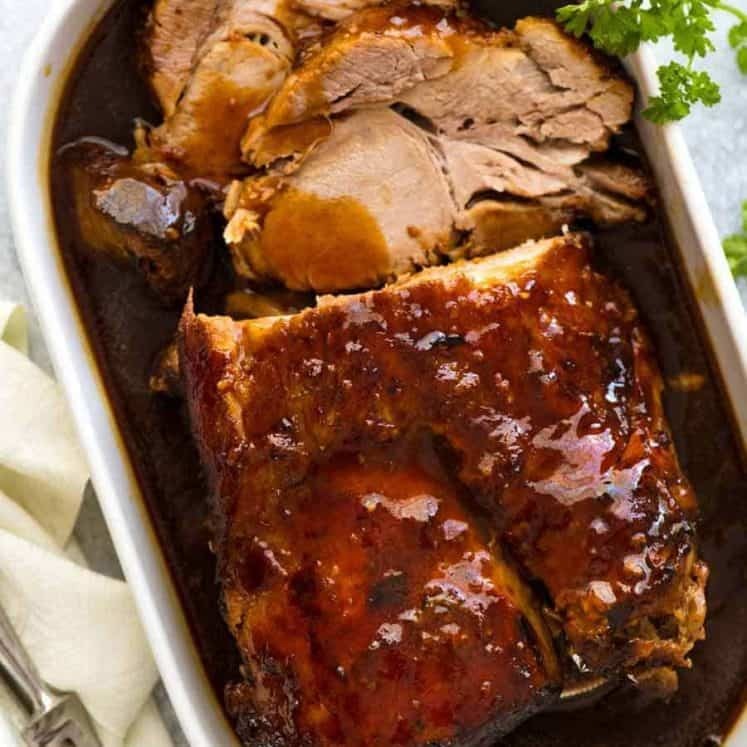 This is my favourite ham bone recipe – slow cooked until the rice breaks down, the meat is falling off the bone, and the broth is beautifully flavoured. Slow cooker, pressure cooker or stovetop – I use all 3 methods! While the Western world goes bonkers over the vision of a glistening baked ham ready for carving, the Chinese are rubbing their hands with glee at the thought of the ham bone. 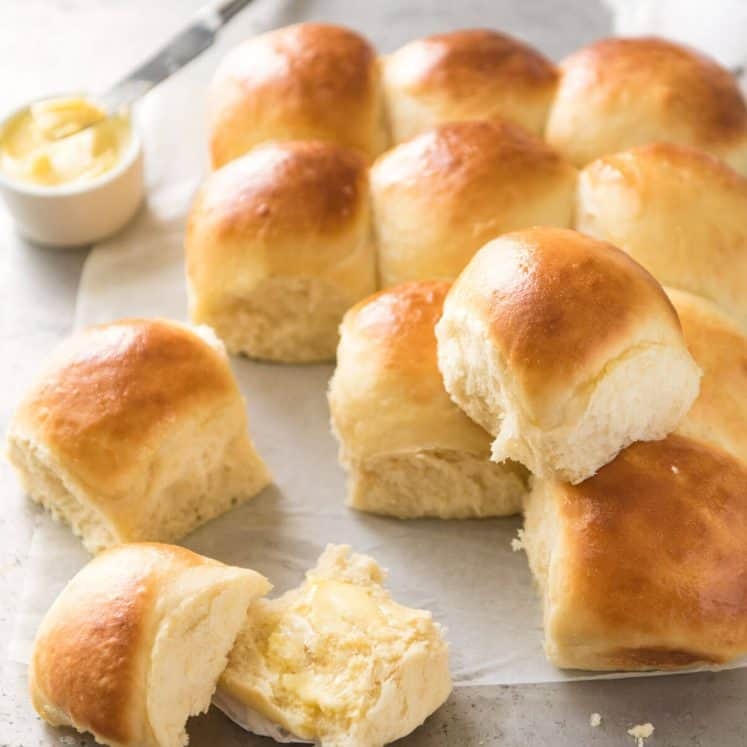 Because this recipe is not just something I made up – though I wouldn’t blame you for thinking so. Chinese Ham Bone Rice Soup is a “thing”. It’s called “Congee” in Chinese, and it’s the source of much discussion over who gets the ham bone from our own Christmas ham – or a pact to use it for a Family Meal – as well as smug announcements when one is able to secure extra leftover ham bones. 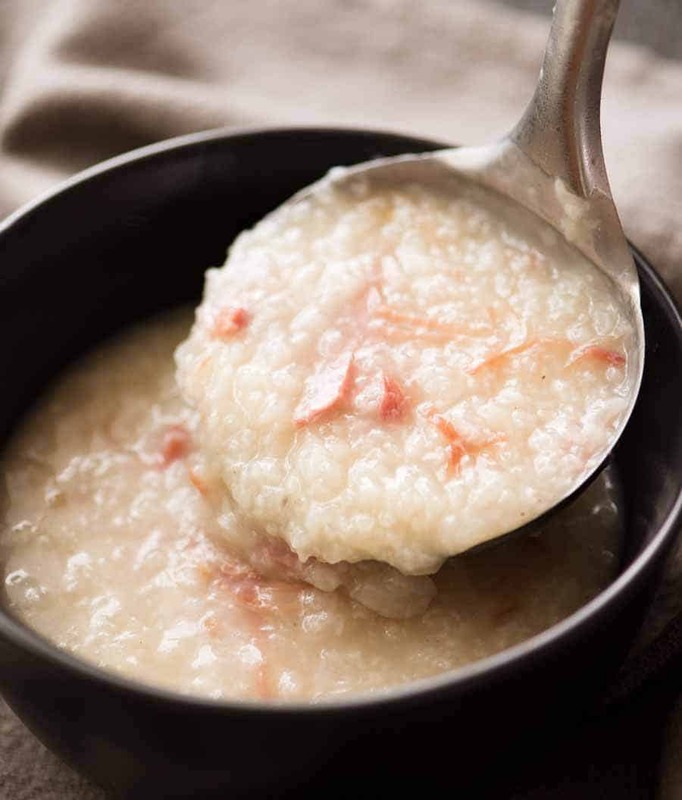 SO – WHAT IS CONGEE? It’s a white Chinese rice soup / porridge that’s made by slow cooking rice in broth until it breaks down and thickens the soup. 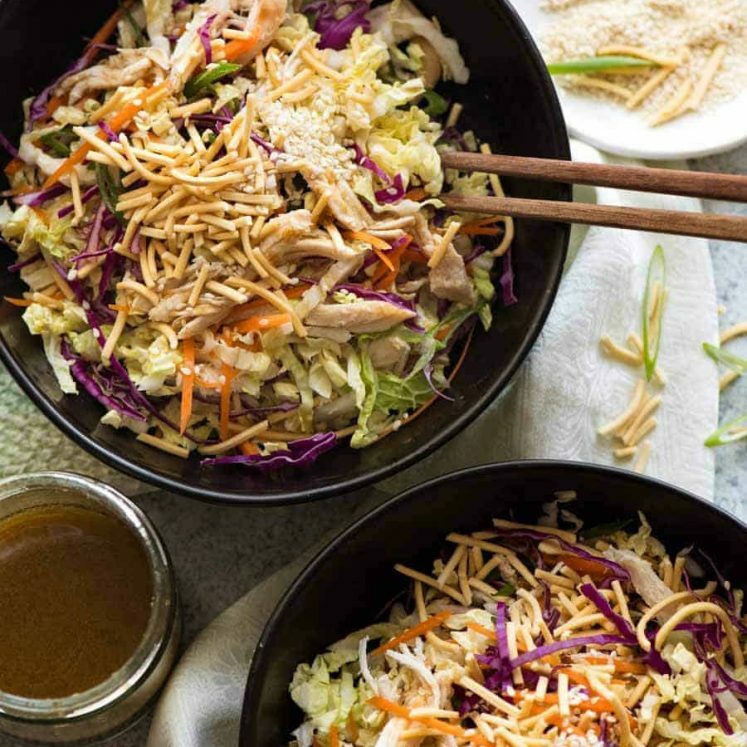 It’s mostly rice and broth with just little bits of stuff in it – usually fish and chicken – so it’s highly economical. The consistency varies from a soft, porridge-like consistency which has a lovely creamy mouth feel, to a more runny texture which is more like liquid broth with soft rice bits in it. In case you didn’t read between the lines, I’m not a fan of watery/runny Congee! In China and Hong Kong, Congee is typically served for breakfast with big, puffy deep fried bread sticks for dunking, but I usually have it for dinner (no puffy fried bread sticks!). 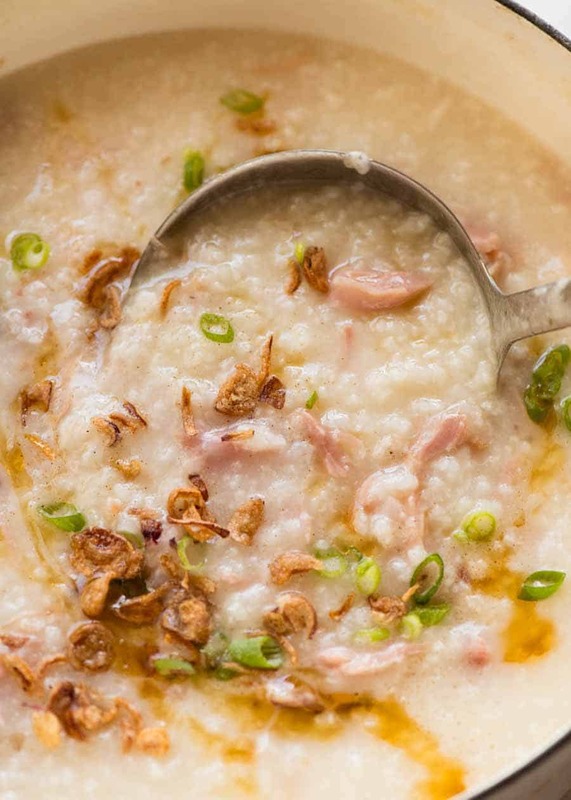 The key to a great Congee is the broth, and hence why the Chinese go mad over leftover ham bones. 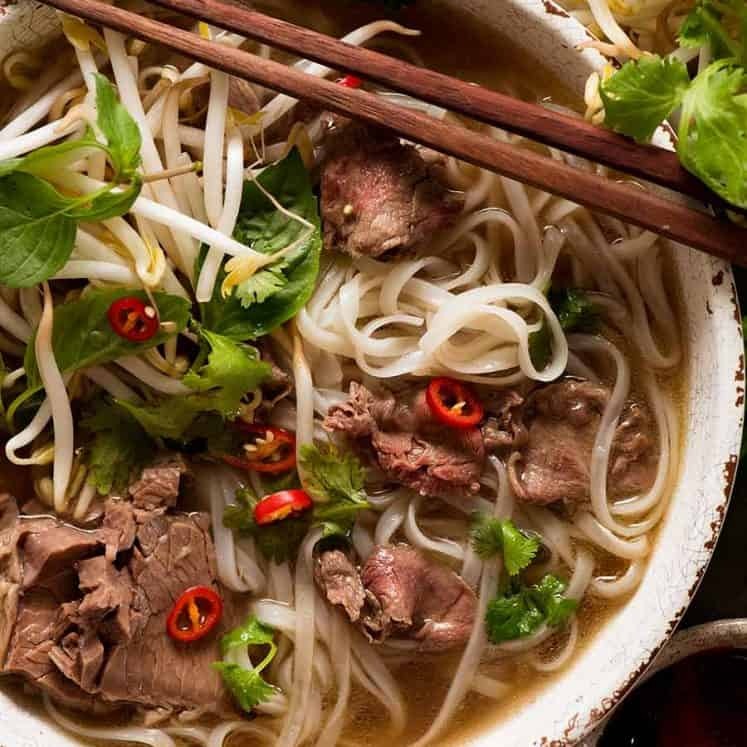 It makes an incredible broth – no other flavourings needed. BE WARNED: THIS IS CRAZY EASY!! Place rice, lots of water, and ham bone in a pot, slow cooker or pressure cooker. Shred ham, return to pot, simmer a bit more. That’s it. Yes, it really is that easy. I exaggerate not when I say I think this is the ultimate 3 ingredient meal! 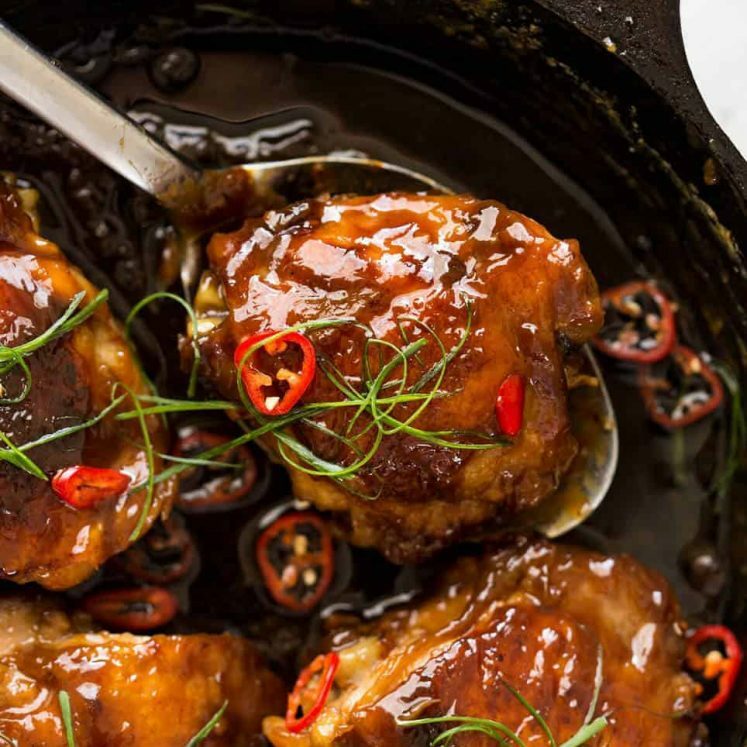 This is a recipe that can be made on the stove, in the slow cooker or pressure cooker. It’s ideal for all 3, and I use all 3 methods. Pressure cooker means I can have it tonight, slow cooker if I’m out all day or if it’s a giant bone. And in winter on the stove, almost always. As for garnishes, at the very least, I like to sprinkle with some chopped green onions. Something crunchy like Asian Fried Shallots (pictured) or even Chang’s crunchy fried noodles is terrific. Chinese Congee shops typically serve it with strips of crispy fried wonton skins. Recipe video above. 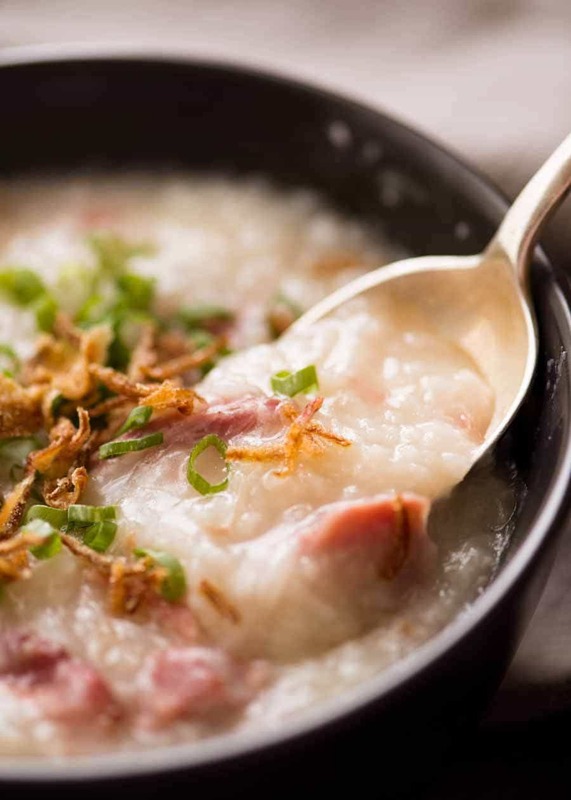 The ham version of the traditional Chinese rice soup known as Congee - Rice slow cooked until it breaks down to thicken the broth flavoured with ham bone. Every year, the Chinese fight over leftover Christmas ham bones to make this! 🙂 But actually, using a store bought ham hock is safer - see note 1. 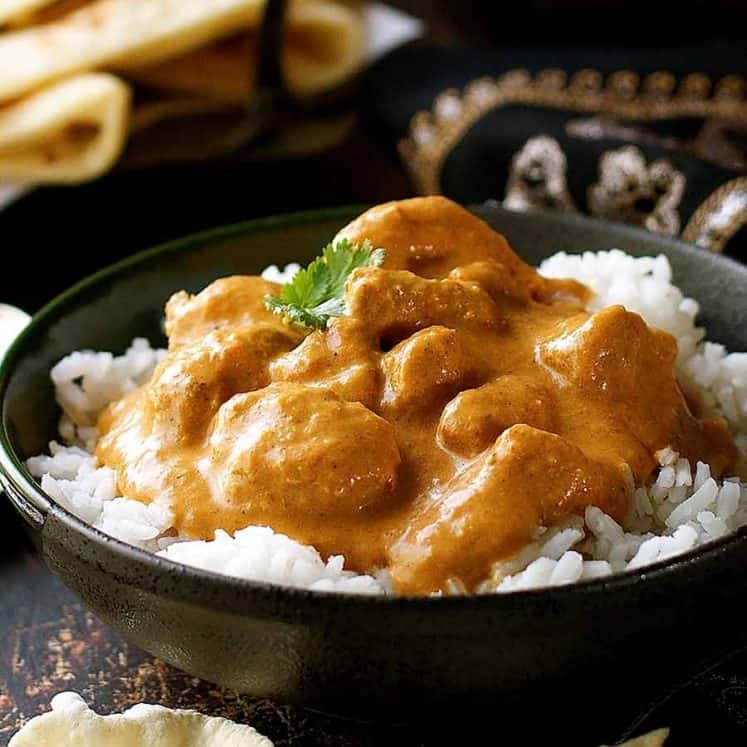 Place bone, rice and water in a large pot, slow cooker or pressure cooker. Cover with lid. Cook using preferred method (times below), or until meat on ham is tender enough to shred. Remove ham from soup, shred meat. Discard fatty / thick skin and sinew, keep bone. Use scissors if needed to chop meat. Stir rice well, then return meat AND bone into soup. Cook using preferred method, until rice is broken down and soup has a porridge like consistency - see video. Remove bone. Stir vigorously, then adjust consistency with water if desired. Or simmer uncovered if necessary to thicken. Adjust salt to taste (I usually just need a pinch), add a dash of pepper. Serve rice soup garnished with green onions, a sprinkle of Asian Fried Shallots and drizzle of sesame oil. Storage tip: Return bone into the soup, it continues to add flavour. Stove: Simmer on low for 1 3/4 - 2 hours (no stirring), shred meat, then on low for 30 minutes, stirring every now and then. 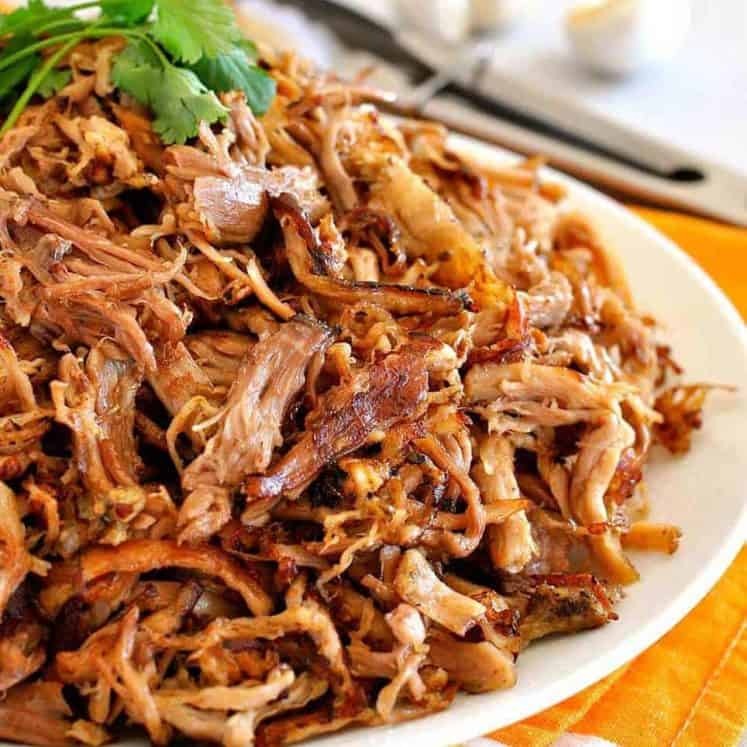 Slow Cooker: Low for 8 hours, shred meat, then low for 1 - 2 hours. Pressure Cooker: High for 50 minutes, shred meat, then high for 15 minutes or 20 minutes on sauté function. 1. 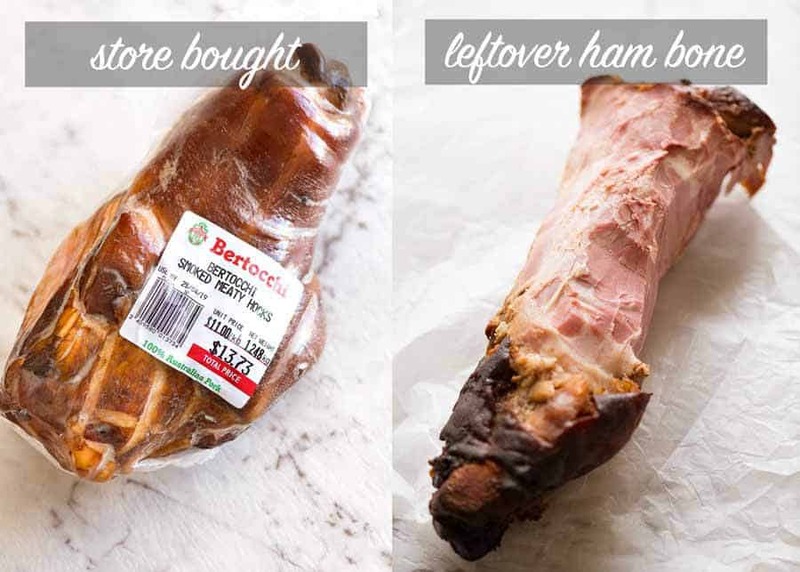 If you're using a leftover ham bone, you do need to ensure there's plenty of meat left on it. It's not so much about having enough ham bits in the soup, it's about flavouring the broth. 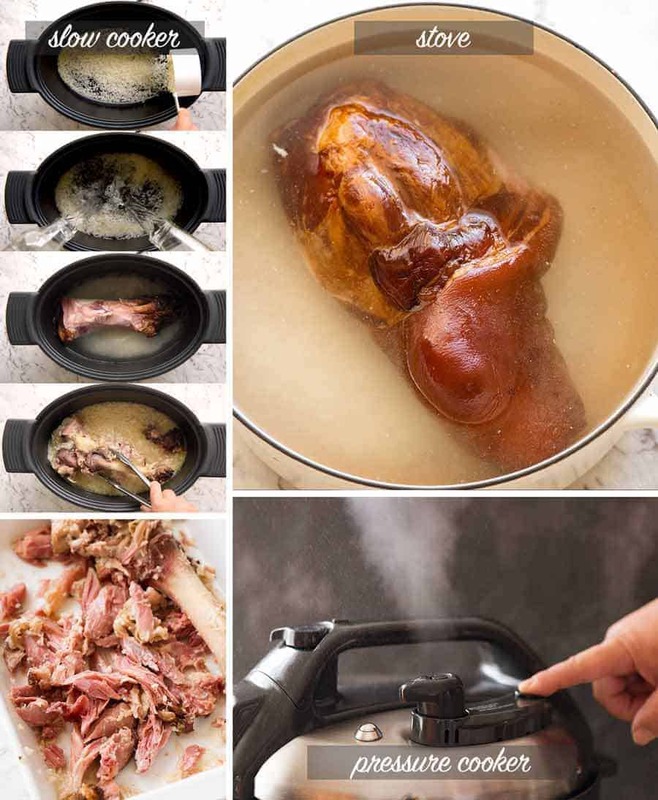 It's safer to make this using a store bought ham bone because it comes with plenty of ham and a thick layer of smoked skin which adds plenty of flavour to the broth. Note ham hocks are mostly bone and fatty skin which is discarded - about 60 to 70% on average. 2. Congee is traditionally served with strips of crispy fried wonton skin as a garnish. 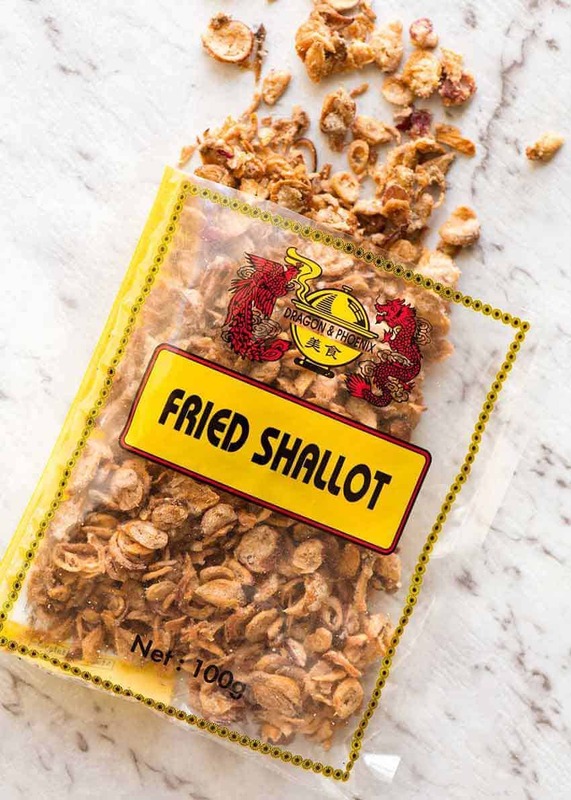 I never bother at home - instead I use store bought Asian fried shallots or onions which not only add the crisp factor, they add flavour and little pops of salt too. 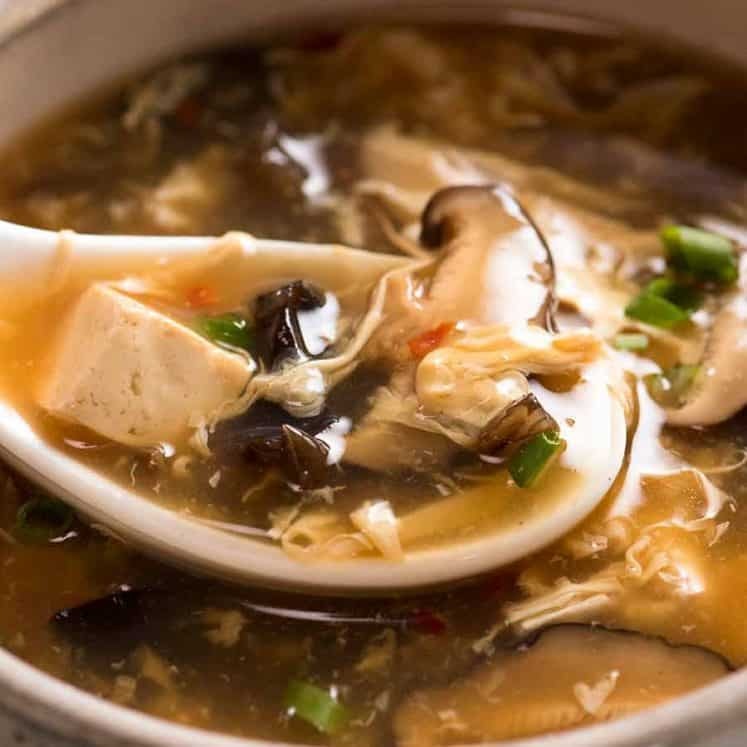 - Ensure the bone is mostly submerged - if not, it may require turning during cooking because the part submerged in the broth cooks faster. Also, exposed ham = less flavour in rice, so you may need to cook a bit longer post returning shredded meat into rice to infuse more flavour into the broth. 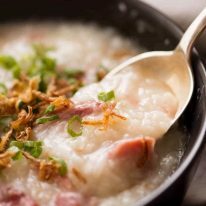 - This recipe yields a congee with a generous amount of ham per serving. Normal shop bought congee is mostly rice and soup with just a tiny bit of stuff (fish or chicken usually). I have a higher ratio of ham to rice to ensure you get good ham flavour in the broth. You could add another 1/4 cup of rice and 1 3/4 cups water, to stretch it out more, but I wouldn't do more than that. - The broth gets infused with more flavour once the shredded meat and bone is returned to the soup for the 2nd phase of cooking. - Careful of over salting, the ham continues to leach salt into the broth when the soup is sitting around. 4. Make ahead - ham has a good shelf life, so I feel comfortable keeping it in the fridge for even 5 days. 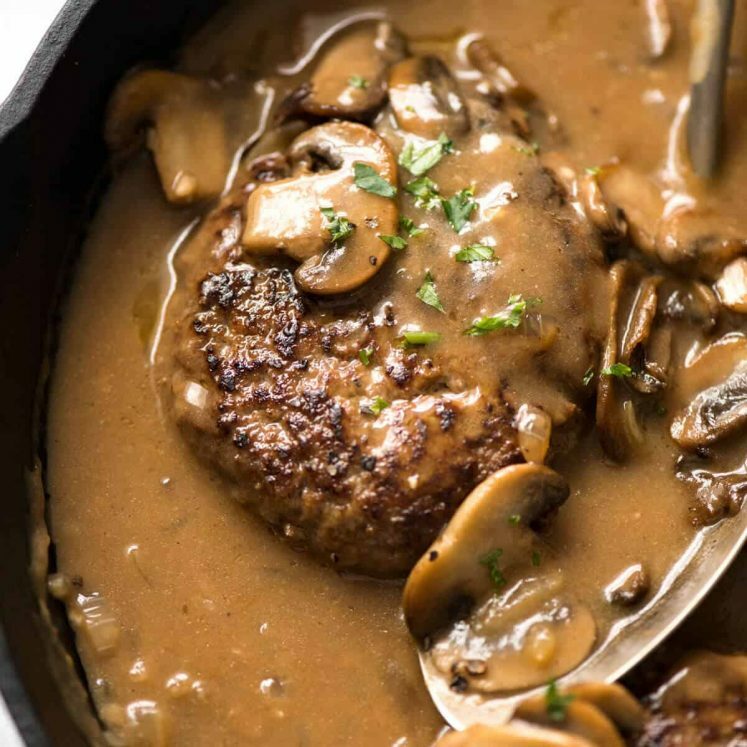 It will congeal but loosen up when reheated Add a touch of water to loosen. I haven't tried freezing it. 5. Complete the meal by adding vegetables into the soup. eg. add stems of Chinese vegetables chopped into spoonable sizes and cook until tender (or cook separately and divide into bowls, top with soup), then stir the leafy bits in just before serving. You could do the same with spinach too. 6. Nutrition per serving, assuming 5 servings - about 2.5 cups per serving. Excludes toppings. When he escaped my clutches…. PS Don’t worry, they’re doggie cupcakes and yes, I promise to do the recipe soon! Hello! I just made the congee for an Asian-themed potluck. I saw someone’s comment about not being sure how it would work frozen. Based on the little taste I just took as it’s finishing up, frozen bone is no problem 🙂 Thank you for sharing! I’m so glad you tried it Blaire! Wow wee, what a ripper of a recipe! Did the crockpot style; how effortless is this? I’ve seen congee when on holidays but always thought it was based on porridge (oats) which turned me off. Watching tourists I did top my congee with boiled egg, shallots & chilli – absolutely delish. MOTH says his colleagues were popping in following their noses. Thanks Nagi & Happy 2019! It’s just so easy isn’t it!!! 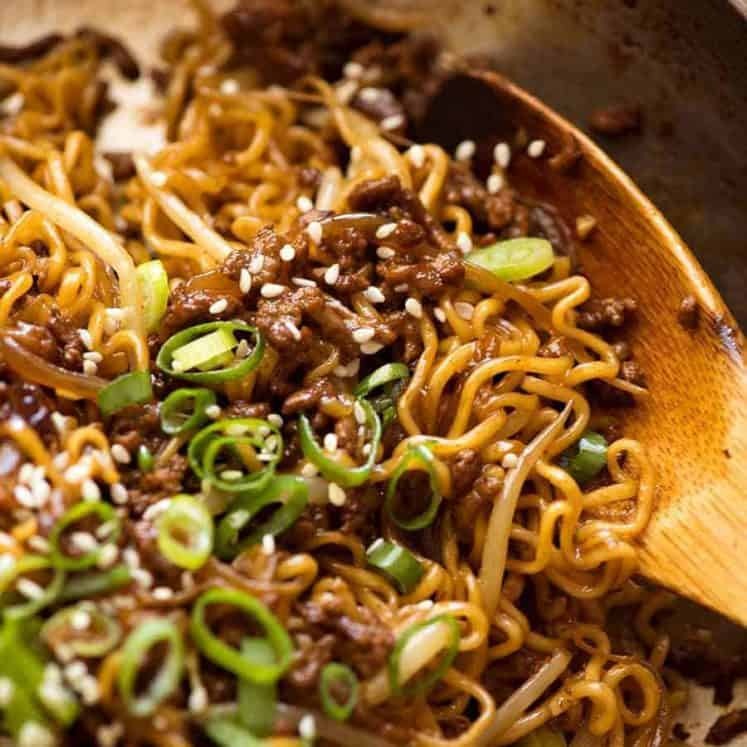 Love love love this recipe Nagi. Simple easy and tasty. I used the store bought hock. Left it in slow cooker overnight. Needed a bit more water though as I found it a bit dry. Had too much so had to freeze a tub. Let’s see how it goes defrosted…. Hi! What size slow cooker did you use? Thanks! This was so easy and turned out great! I waited for Woolies to have 50% off their ham hocks and then threw it all into the slow cooker. So very delicious! I still have an hour to go in the slow cooker after putting the bones and shredded ham back… I just had to taste a little bit. Then another little bit. I just filled a tiny bowl and gobbled it up. I have to stop before it’s all gone and I haven’t even sprinkled the spring onion and fried onions! Hi, Nagi! Flap in California: Sad 🙁 to say this was a fail for me. I chose to use the stove top method, and had 3 large bones, a bit over 2 pounds which appeared to have lots of meat on them. Too bad I couldn’t see under the heavy skin/fat layer, because I wound up with less than 1/2 cup of meat to add back to the broth. I measured water/rice ratio carefully but in cooking the rice just sort of disappeared, leaving a cloudy, watery base without flavor. I had a large pile of bones, skin and tons of fat, which just went into the garbage. The optimist in me made me at least try tasting, but it was nasty; no flavor at all, just a greasy, gluey mess. Bleah. Because I am still a novice cook, I will try this again, to see if I can make it work, but I think I may cut the water/rice ration down while adding several more hocks to flavor the dish. Maybe I can try adding some cooked ham bits from a ham steak before serving. Odds are still in my favor though, if I can fix this I’m darn sure going to try. I learned a bit about flavor adjustments though so it was a worthwhile adventure. I slow cooked ham bone several hours wthout rice then cooled in refrig overnight. I removed the thick layer of fat then added rice and cooked til consistency described in recipe. Delicious even without the extra fat! The next morning I was in a big rush so I pulled out the leftovers and a ate a few bites cold, even more delicious! 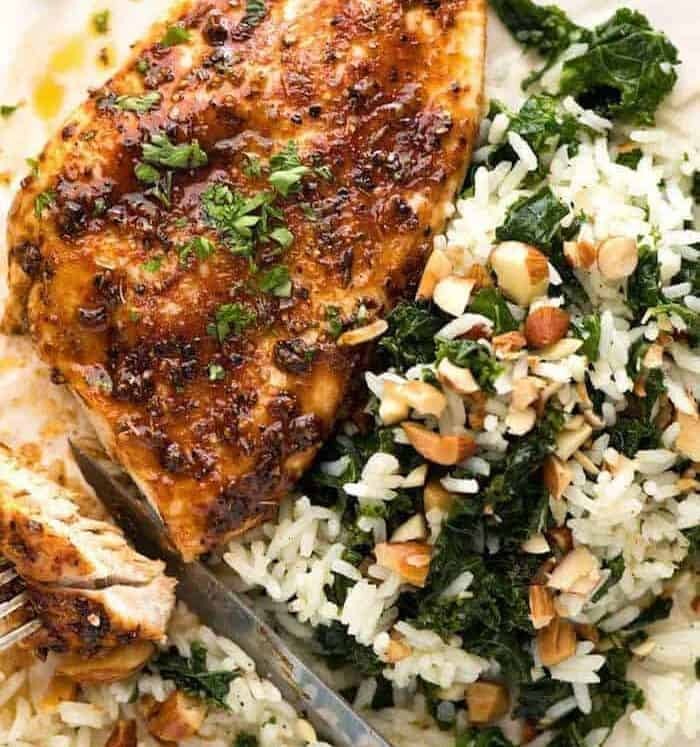 Do you think the recipe would work with brown rice? What do think about using a grain such as quinoa or freekah? That’s great to hear!! Unfortunately I don’t know about brown rice or the other grains. I haven’t tested how they break down to make a soup like this! If I do a test with brown rice or other grains I will let you know the results. Thought it was about time I dropped you a note from sunny Scotland to say thanks for the excellent site. Being fairly new to this cooking from scratch activity, I cannot emphasis enough how the quality of your methods/tips/videos and general recipe layout make life so much easier for a kitchen novice. To date I have been successful (not only my opinion!) with about 5 recipes, the most recent being the turkey balls (These were described as “delicious”). I’m about to try the Ham Congee as per your recipe, however, I would also like to try it with quinoa. Your thoughts on this change would be much appreciated. 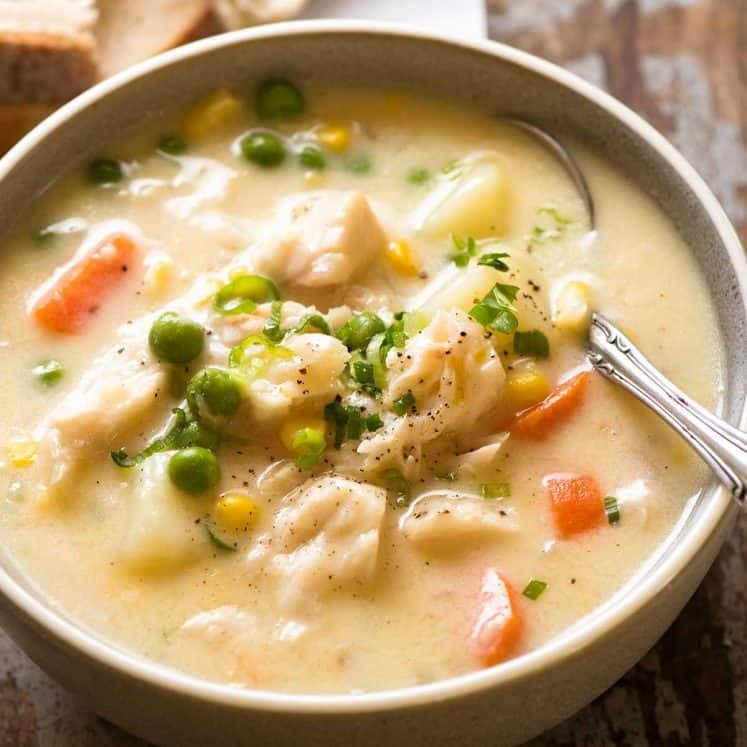 I am really excited about this recipe and the only thing I have ever made with a ham bone is split pea soup…and my hubby won’t eat split peas on a bet! I just have one question. Normally I put just ham bone and water in crockpot and cook bone for a long time. Then I chill stock and skim off the fat before makign the actual soup. Would this rice soup still work if I start with already cooked and strained ham stock? Just a quick note about your doggie muffins. My friend had a sister that sent her some homemade dog biscuits but since she didn’t have a bone shaped cutter, they were round. She left them on the kitchen counter and left the house to run errands. When she returned later that day she noticed quite a few were missing so she asked her teenage son if he had gotten into the cookies, a common nickname for dog biscuits. She was a little concerned because she had a Cocker Spaniel and she didn’t want her overfed. Her son’s priceless response was yes, they were a little dry but were otherwise pretty tasty! Of course, there was only food grade items in it so nothing that we don’t normally eat, but we had a good laugh. On another note, one of my rescued Siberian Huskies was starved and emaciated when we adopted him and probably because of this is a food thief. He can sniff out food our others never bother and open tins and plastic screw type lid. 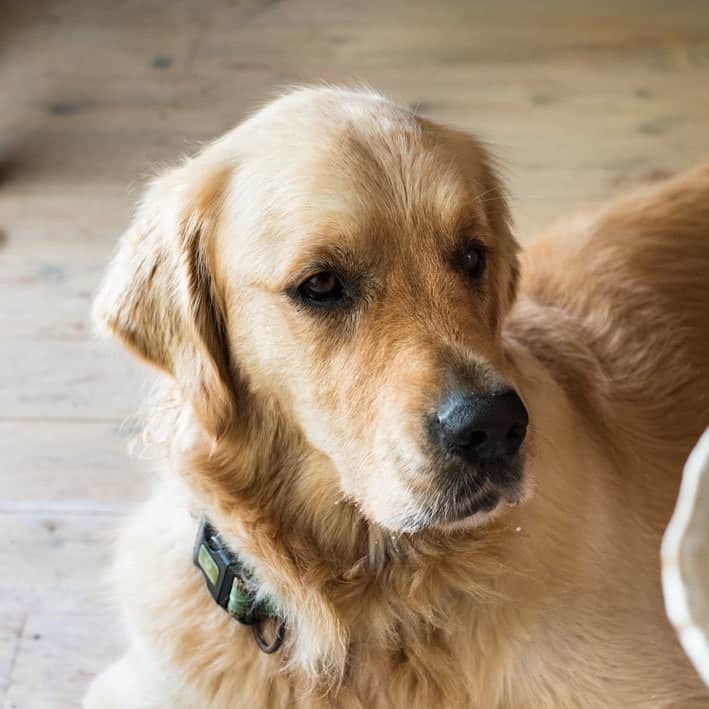 If those muffins have peanut butter in them and he was around, you would not have any left to photograph. He has no shame and would grab and go! We keep a lot of baked goods in the oven and microwave because even though he has been well-fed for over a year, he will probably always feel this need. He can sniff out a forgotten wrapped peanut butter cup on another floor of the house that is off-limits to him and figure out a way to get to it, but we can’t punish him for his previous abuse so we just laugh about it and protect what food we want to eat later. That would be a tower of temptation for him! 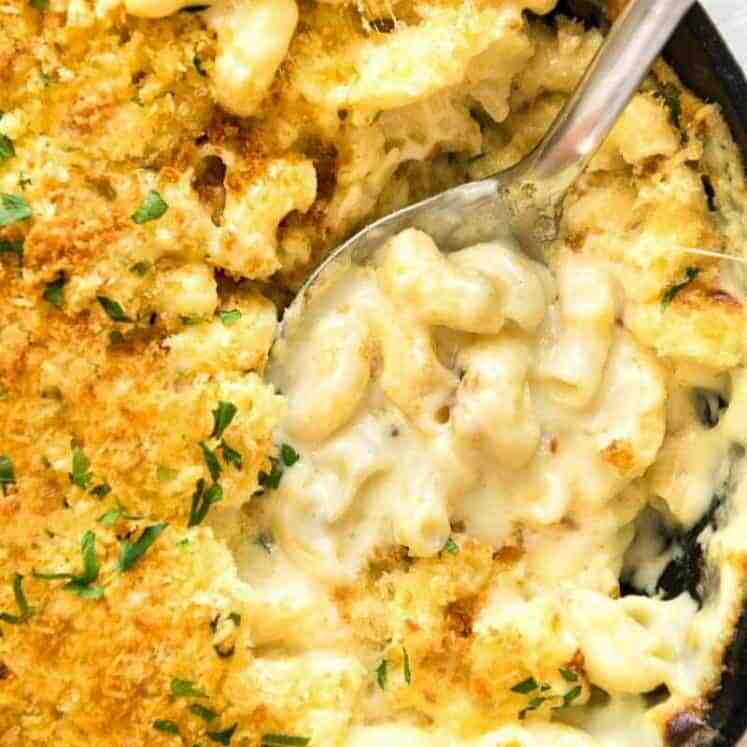 Thanks for this recipe, I always enjoy your emails and reading your recipes. I love split pea soup made with ham bone but my hubby can’t eat it. Since he usually does the cooking, I showed him this as an alternative and he is going to try it. He doesn’t use recipes, so this is a HUGE step for him! Just another hint but the stores that sell the spiral sliced ham sell the bones and after Christmas, Easter and Thanksgiving the price is about $5 USD. 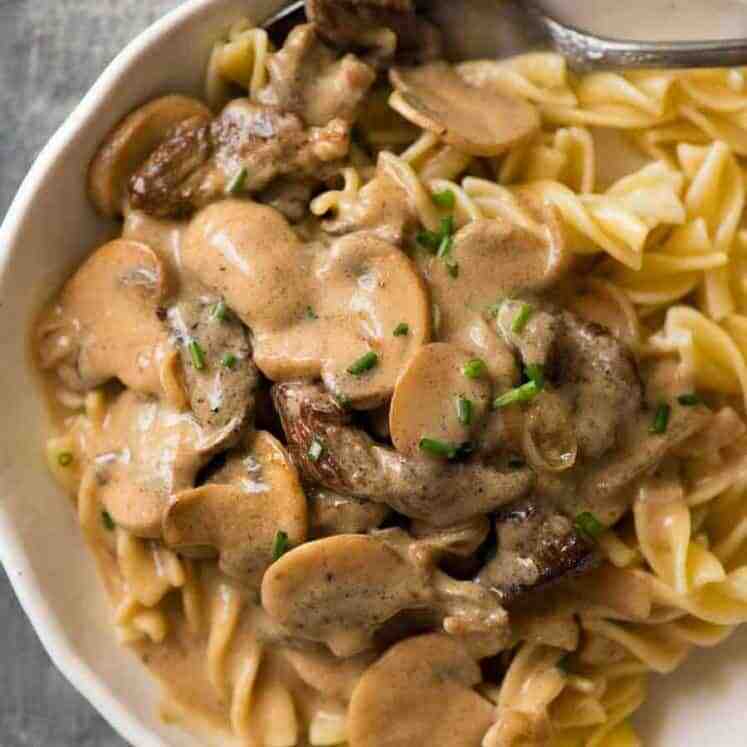 We usually get a few and throw it in our deep freeze to use later and the bonus is that there’s always been a large amount of meat left on, sometimes enough to get several cups to chop for other recipes and still more than enough for a very meaty soup. I do that too! I love getting post holiday ham sales 🙂 Keeping my 🤞🏼 that he approves of this…. Oh boy. I went to my hometown sausage factory/retail outlet and bought a spiral cut delicious ham. Got home and cut off all the meat- not ALL the meat. Hubbie came home and wanted to see beautiful ham. I showed him the plastic container it was in. Poor thing had a meltdown. Ibsat on floor with some ham in my hand, feeding him like a lost puppy and explained. Showed him the recipe. Today, we havr stuffed ourselves with congee, delicious, velvety congee. Thank you soooo much. Hubby thanks you too. This good old Southern girl makes this with chicken gizzards and rice. Add in a little chopped celery and onion. My, my, my…so good! Thanks for this recipe. Having it for lunch today. “Pork Jole Bacon” is the closest thing they had at my grocery store. Is that ok to substitute? 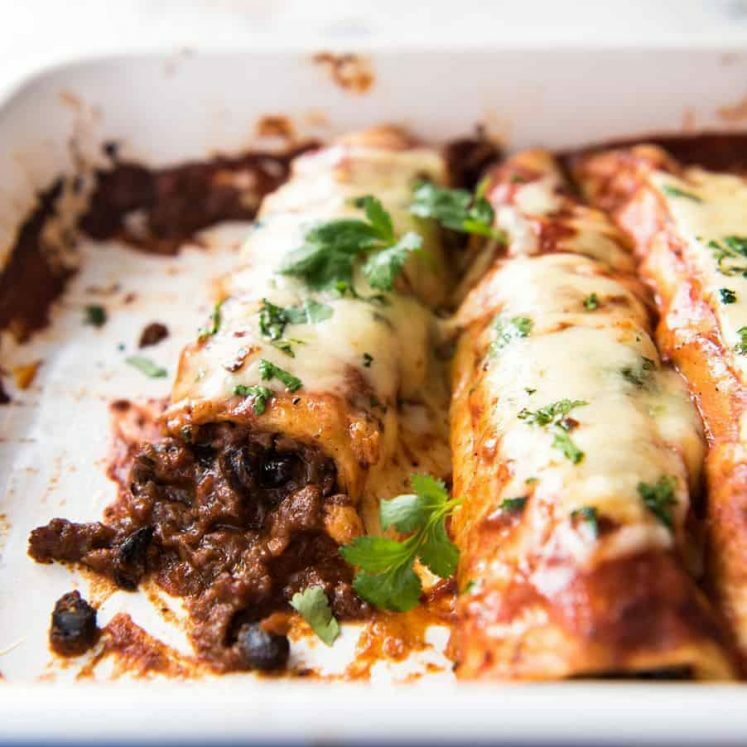 I cooked this recipe last night in the slow cooker for 8 hours. I took the bone out and shredded the meat and put in the fridge. Turned off the cooker because I wanted to go to bed. Added the meat this morning and cooked for the extra 2 hours. OMG! It is so full of flavour. I have already had three bowls topped with fried and fresh shallots. It is my most favourite food of Asia. I have it for breakfast every morning when we are away but have never made it at home. I have cooked a number of your recipes and have loved every single one of them. Never have I had a failure. Forget all those celeb cookbooks your run rings around them. 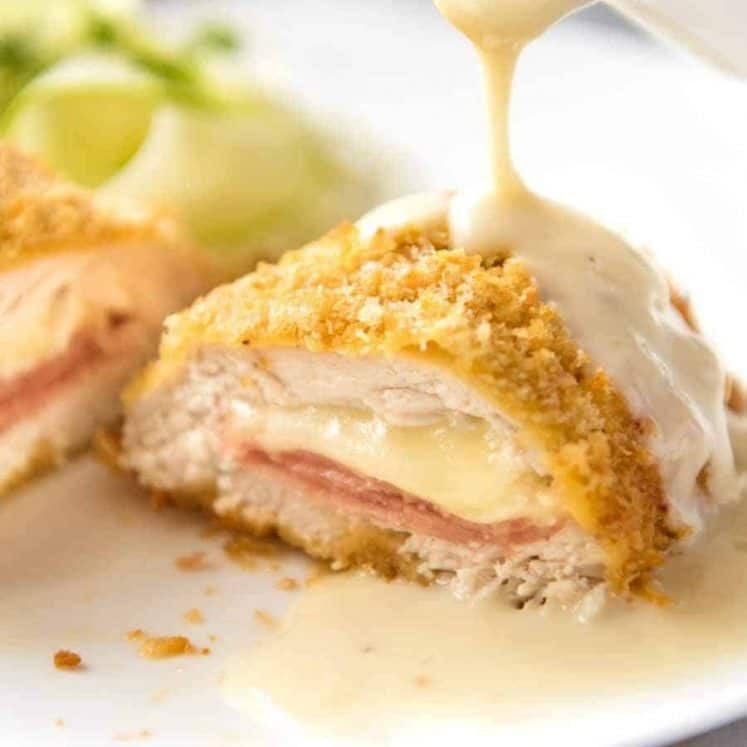 This recipe is so yummy!!!! 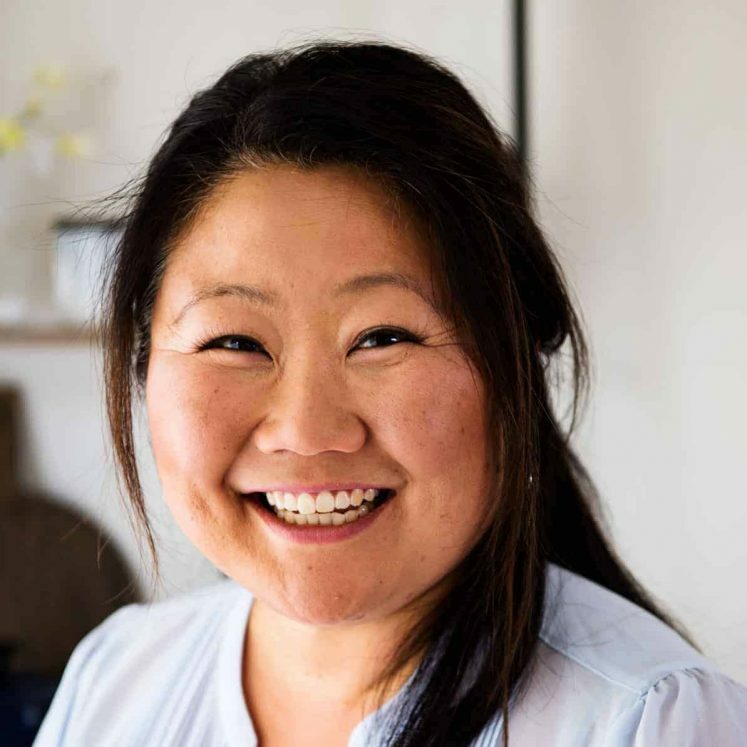 I am thinking that is because this lovely lady, Nagi, tests her recipes at least three times, to ascertain if there are any tricky bits to the recipe! Yes, I have thrown out most of the recipe books I owned and now, I have a list of Nagi recipes. They have ingredients that are easily sourced, and no stupidly, difficult techniques! they just work! Seriously, all my hats are getting TIGHT! !